Yam, Anna and Marsiske, Michael 2013. Cognitive Longitudinal Predictors of Older Adults’ Self-Reported IADL Function. Journal of Aging and Health, Vol. 25, Issue. 8_suppl, p. 163S. Bäckman, Lars 2009. 12. Plasticity of memory functioning in normal aging and Alzheimer's disease. Acta Neurologica Scandinavica, Vol. 82, Issue. S129, p. 32. Roth, Wolff-Michael 2007. Emotion at Work: A Contribution to Third-Generation Cultural-Historical Activity Theory. Mind, Culture, and Activity, Vol. 14, Issue. 1-2, p. 40. Haught, Patricia A. and Walls, Richard T. 2007. Longitudinal Adult Practical Problem-Solving: 1983, 1993, 2003. Educational Gerontology, Vol. 33, Issue. 5, p. 395. Dhami, Mandeep K. Hertwig, Ralph and Hoffrage, Ulrich 2004. The Role of Representative Design in an Ecological Approach to Cognition.. Psychological Bulletin, Vol. 130, Issue. 6, p. 959. Martin, Mike and Kliegel, Matthias 2003. Die Entwicklung komplexer prospektiver Gedächtnisleistungim Kindesalter. Zeitschrift für Entwicklungspsychologie und Pädagogische Psychologie, Vol. 35, Issue. 2, p. 75. Meegan, Sean P. and Berg, Cynthia A. 2002. Contexts, functions, forms, and processes of collaborative everyday problem solving in older adulthood. International Journal of Behavioral Development, Vol. 26, Issue. 1, p. 6. Knez, Igor and Kers, Christina 2000. Effects of Indoor Lighting, Gender, and Age on Mood and Cognitive Performance. Environment and Behavior, Vol. 32, Issue. 6, p. 817. Grigorenko, Elena L. 1999. Current Trends in Education in Russia: Preliminary Outcomes Indicative of Students' Cognitive Development. International Journal of Psychology, Vol. 34, Issue. 3, p. 175. Blanchard-Fields, Fredda and Hertzog, Christopher 1999. 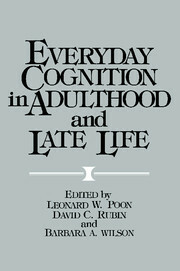 Introduction to the Special Section on Cognition in Everyday Life: Adult Developmental Aspects. International Journal of Behavioral Development, Vol. 23, Issue. 3, p. 545. E. Whitfield, Tamara Baker-Thomas,, Keith 1999. Evaluating a Measure of Everyday Problem Solving for Use in African Americans. Experimental Aging Research, Vol. 25, Issue. 3, p. 209. Woods, Bob 1994. Management of memory impairment in older people with dementia. International Review of Psychiatry, Vol. 6, Issue. 2-3, p. 153. Yesavage, Jerome A. Dolhert, Nancy and Taylor, Joy L. 1994. Flight Simulator Performance of Younger and Older Aircraft Pilots: Effects of Age and Alcohol. Journal of the American Geriatrics Society, Vol. 42, Issue. 6, p. 577. Cromwell, Sandra L. 1994. The Subjective Experience of the Subjective Experience of Forgetfulness among Elders. Qualitative Health Research, Vol. 4, Issue. 4, p. 444. Willis, Sherry L. Jay, Gina M. Diehl, Manfred and Marsiske, Michael 1992. Longitudinal Change and Prediction of Everyday Task Competence in the Elderly. Research on Aging, Vol. 14, Issue. 1, p. 68. Hnatiuk, Sarah H. 1991. The Thoughts of Elderly Women Living Alone: Relationships with Mood and Activity. Imagination, Cognition and Personality, Vol. 10, Issue. 3, p. 231. Cornelius, Steven W. 1990. Aging and Cognition - Knowledge Organization and Utilization. Vol. 71, Issue. , p. 411. Provides a firm theoretical grounding for the increasing movement of cognitive psychologists, neuropsychologists and their students beyond the laboratory, in an attempt to understand human cognitive abilities as they are manifested in natural contexts. The pros and cons of the laboratory and the real world - the problems of generalizability versus rigor - are thoroughly analyzed, and practical escapes from what has become a false dichotomy are suggested. The authors present relevant data that open up new directions for those studying cognitive aging. Finally, they consider the applications of the new knowledge for clinicians and educators. 10 - Introduction to Part II: What do we know about the aging of cognitive abilities in everyday life?